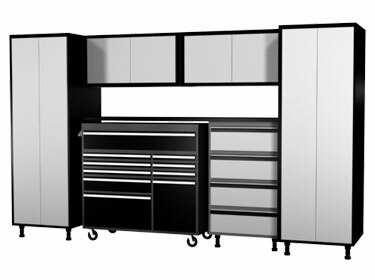 A 10x6 foot Tech Series Garage Workstation - Cabinets and Tool Chest Storage. An efficient storage space to help organize your garage while also keeping your tools within arms reach. Perfect for weekend warriors looking to spruce up their garage while adding usable functionality. As shown the optional cabinet drawers replace the doors in our standard base cabinet adding more utility at a low price! This is a great standalone cabinet system for the weekend warrior seeking extra storage and also makes a great addition to any of our other cabinet systems. For custom cabinet configurations or our current specials please contact us.